TORONTO - The Dufferin Groove and Beau's Beer Hack skated to a 1-1 tie this past Saturday night at Upper Canada College. Meanwhile the Humiliation defeated the Morningstars 3-1 and the Wheatfield Souldiers edged the 1st-place Parkdale Pocupines 2-1. Lance Moreton got his side on the board first, taking a pass from Hack linemate Mike Woodgate to solve Groove goalie Mario Pistone just two minutes into the opening frame. 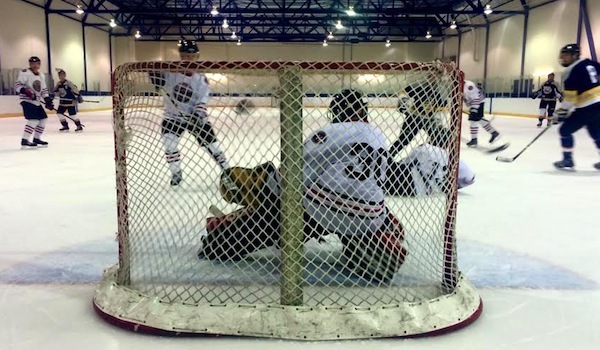 A full period later it was Hack goalie Aaron Brophy's turn to see red as Groove forward Peter Freeman completed a passing play with James McCudden and Todd Meaney to put one up and over the tender's catching glove from the slot (see remarkably illustrative photo above). The Hack (4-3-3) out-shot the Groove (2-4-1) by a margin of 7-2 in the 3rd period, but neither team would register any more goals as they settled for a handshake and a single point each. The Humiliation's Jim Sioukas and Luke Moretti combined for six points on the night as the Orange Tide got the better of the visiting Morningstars to the tune of 3-1. Sioukas opened the scoring at the 4:00 minute mark of the 1st period, getting the puck past goaltender Mark Robinson with the assistance of Moretti and fellow Humiliation veteran Nicos Fassler. Three-and-a-half minutes later it was Moretti's turn to light the lamp, as he slapped in a feed from Sioukas to give his side a two-goal lead. Shortly after the opening faceoff of the 3rd period, though, Morningstars vetreran Rich Green converted a pass from Chris Topping to finally solve spare goaltender Aaron Carfagio, who played no small role in the Humiliation's victory as the Mornigstars out-shot their opponent by a considerable margin of 24-13. Moretti would strike again late in the 3rd with Sioukas assisting on that one as well. The win improved the Humiliation's season record to 4-4-2 (good for 3rd place in the standings, when combined with bonus points for penalty-free contests) while the Mornigstars finish out their four-game UUHA exhibition series with a record of 1-3-0. The 1st-place Parkdale Porcupines saw their three-game winning streak come to an end while the Wheatfield Souldiers made it three in a row with a 2-1 victory on Saturday night. Rodney Merchant opened the game's scoring by claiming a dump-in back in the Souldier's zone and converting a successful end-to-end rush ultimately beating goaltender Andrew Stirk unassisted. The Porcs replied three-and-a-half minutes later, though, as Corey Thorn combined with Todd Moffat and league scoring leader Adam Thrasher to solve Souldiers goalie Sheldon Shurland and tie the game at a goal each. But moments after the end of an ineffective power-play, Souldiers scoring leader Keven Magura took advantage of a two-man screen to blast a hard point shot over the right shoulder of Stirk, giving Burton's Boys a one-goal lead. The final 7:15 of the game would see several chances for both sides, but the single tally difference would stand as the Souldiers improved their season record to 6-2-1. The Porcupines (6-3-1) remain in 1st place with a one-and-a-half point lead over the next-best Souldiers. The Wheatfield Souldiers will have an opportunity to reclaim top spot in the standings this coming Saturday, Dec. 6 when they take on the Hack at 9:00 PM. A Hack victory could vault that squad into 2nd place, though. The 8:00 PM game features Brockton Rockets (currently 4-5-0) returning to action vs. the Safety First Jokers Hockey Club (3-4-2), while the night's opening contest will see the Gas Station Islanders (3-4-1) face off against the Parkdale Hockey Lads (3-5-1) who, after a strong start to the season, will be eagerly attempting to curtail a streak of four consecutive losses. GSI, by comparison, has lost just one of its past five games. All three of this coming Saturday's matches take place at Upper Canada College.